Scientists believe they have discovered the sites of the cities in archaeological digs, but offer a more scientific explanation as to why the locations were wiped out. Archaeologists state the cities were located on the northeastern edge of the Dead Sea, now called Middle Ghor. What is interesting is that in the sites, scientists have discovered strange minerals which they say are the result of a super-heated asteroid exploding in the region. Radiocarbon dating ages this asteroid explosion at around 3,700 years ago – which would fit in with the biblical timeframe. The researchers have called the asteroid explosion the 3.7KYrBP Kikkar Event and had an airburst yield of 10 megatons. Trinity Southwest University archaeologist and biblical researcher Phillip Silvia says the explosion would have blasted outwards in a 25km wide circular plain, destroying any nearby settlements. 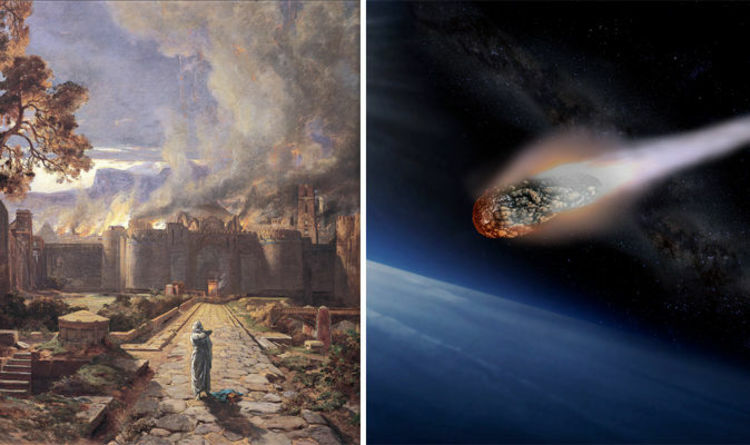 Prof Silvia says he and his city have been excavating the ruins of the Bronze Age city of Tall el-Hammam, near Sodom and Gomorrah, and it is this location which provides the greatest evidence of a low-altitude asteroid explosion. Prof Silvia and his team write on their research website the Tall el-Hammam Excavation Project: “The site had begun (at least) during the 4th millennium BCE, thriving for at least a thousand years as an open agricultural community. “But at the beginning of the 3rd millennium BCE, dramatic disruptions in the relative peace of the region occurred, causing the inhabitants of Tall el-Hammam to construct a formidable defensive system that included a stone-and-mud brick city wall. “The phenomenon resulting in the destruction of civilisation on ‘the well watered plain of the Jordan’ and repelling reoccupation for so many centuries is now coming to light through analyses performed by ‘impact’ researchers from seven participating universities. “That the most productive agricultural land in the region, which had supported flourishing civilisations continuously for at least 3000 years, should suddenly relinquish, then resist, human habitation for such a long period of time has begged investigation. “The physical evidence from Tall el-Hammam and neighbouring sites exhibit signs of a highly destructive concussive and thermal event that one might expect from what is described in Genesis 19.